Month #2 for the year and we have quite the variation in this month's reading list. I'm probably going to be over diaries very soon so this may be the last month you see one of those for a while but we also have a Shakespeare reinterpretation, a fun novel about magazines and a short story collection which is said to be brilliant, if not a touch bleak..
A Florence Diary by Diana Athill-This was a recommendation I chose after spotting it in British Vogue's pages. Side note: British Vogue always do fantastic write-ups of books, I'm not sure if the other editions do and I don't think they've recommended many a book that I have then gone on to read and dislike. Anyway, this slim volume from Diana Athill chronicles her two week holiday to Florence in the Summer of 1947. The adventures, the food and the pleasures and pitfalls of travel. There is something very enchanting about Florence and I'm looking forward to reading these brilliant insights from one rather fantastic writer. Hag-Seed by Margaret Atwood-Another fantastic writer whose work I am only, rather shamefully discovering now. The latest release in the Hogarth Shakespeare retellings is based around The Tempest. I actually studied the play for A2 Literature at high school and loved it. Not only was it entertaining but incredibly clever and whimsical. Going off the description I have linked, it almost sounds like it is a play within a play and I have only heard good things about it. In fact, I would not be surprised if this ends up being my favourite book this month. Air Kisses by Zoe Foster Blake-After really enjoying the fun and escapism that The Wrong Girl gave me in the midst of a certain election this may again prove to be just the literary tonic some of us need. Air Kisses follows an unlikely beauty editor and her mishaps with magazine-dom and love among other things. It will definitely be making its way into my beach+pool bag this month. That is for sure. Difficult Women* by Roxane Gay-This is not Roxane Gay's first foray into fiction but I have only read Bad Feminist previously so it is my first introduction to her creative writing. Admittedly I do not know a lot about this book. I have seen some reviews that say the stories can be a bit depressing so some tactfulness may be required with the reading of these stories. If I find anything that may be particularly triggering for anyone who may want to read it, I'll flag it in my review on Goodreads. 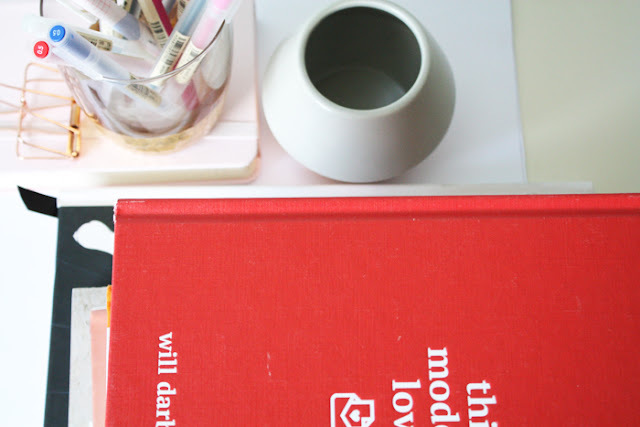 -What are you reading in February? 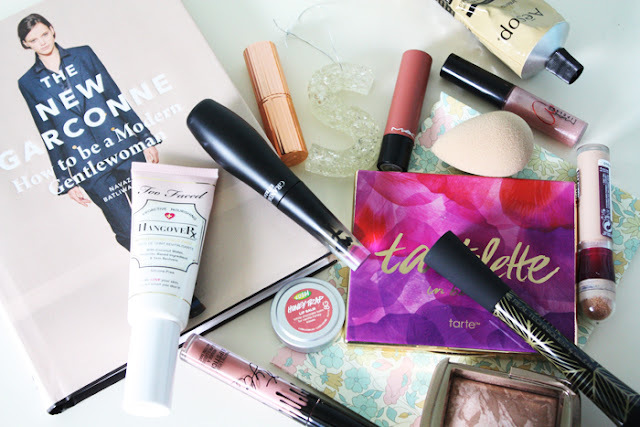 Just like that January is almost behind us so naturally it is monthly favourites time. 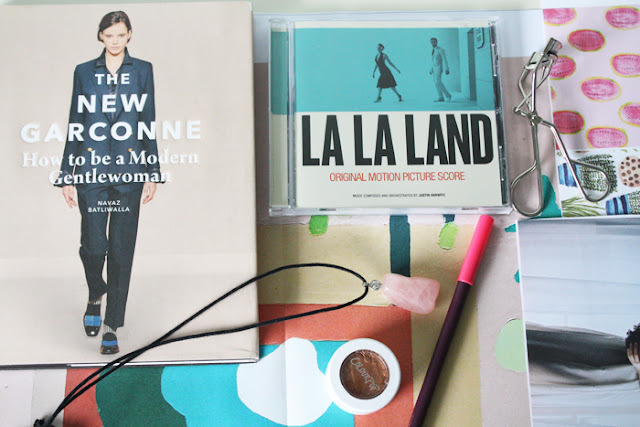 This month we have the movie that has got the world in a bit of a frenzy, an eyeshadow I'm smitten with, the book that surpassed my expectations and more..
Necklace x Tree of Life-This was part of my Christmas present from my lovely friend Amy. I cannot find it on the website but I have been wearing it constantly. Especially since my other favourite necklace broke. It's simplistic but I love it and will continue to wear it to death. Colourpop Super Shock Shadow in Kathleen Lights-Cream eyeshadows have gone back on my radar this month, simply for their ease of use but also the somewhat seamless colour payoff they tend to deliver. Colourpop's are some of my favourite and this bright golden copper is stunning. I love bronzier shades like this, especially when they have the longevity to go with it as well. Pixiwoo Present: Hollywood Icons, not pictured-Another Christmas present, this time from myself to myself. It also came with an exclusive, 1920's inspired designed blush brush which I'm actually using for bronzer. Anyway, extras aside. I loved this documentary that Sam and Nic created in collaboration with the BBC. They interviewed experts on the classic Hollywood fashions and timeless beauty looks of the eras. They also made some rather unsettling discoveries about the gruesome lengths some of the starlets went to in order to maintain their looks. It almost makes the surgery of today look tame in comparison. If you're interested in makeup, in particular the iconic looks associated with Hollywood royalty like Greta Garbo, Audrey Hepburn and Marilyn Monroe among others, you will love this. Sam and Nic have done such an amazing job with it. MAC Eye Kohl in Prunella*, limited edition-This was from MAC's Nutcracker Sweet collection which annoyingly is no longer available but you can buy this colour as part of MAC's permanent collection. This blackened plum is just exquisite. Apart from liquid liner, I tend to go for browner, bronze hues with the odd navy thrown in so I love this softer take on a jet black liner. MAC's eye and lip pencils are some of the best in my opinion and they don't budge once you've applied them. Shu uemura Eyelash Curler-Believe the hype, these are good. They curl your lashes with ease and feel gentle. Eyelash curlers may look like a torture device but we don't want them to ever feel that way. Am I right ladies? These ones aren't the cheapest but they're worth the $$. I've been told they last ages too so that's a bonus. La La Land-After watching this in a somewhat sour mood the first time, I was quite disappointed but I wanted to give it another chance in spite of that. It turns out my utterly bad mood really coloured my perception because I lovelovelove this film. It's special, charming and I like it a lot. The music in particular is fantastic and I love the way the movie is set up visually. The epilogue/dream sequence of sorts is so well done. You'll know what I mean if you have seen it. I feel like it's such a beautiful tribute to creative people, not just those trying to make it in LA. Also it has made me understand the Ryan Gosling appeal and want to relearn how to play the piano. "Here's to the fools who dream." 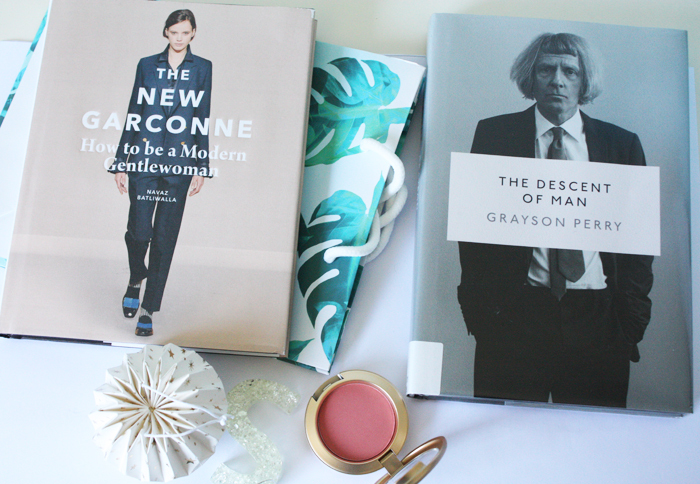 The New Garconne: How to be a Modern Gentlewoman by Navaz Batliwalla-My initial skepticism surrounding this book was quashed after I read it this month. Inside are a selection of profiles with women who are not only style icons when it comes to fashion and interiors but also are pretty savvy in the creative world too. As well as that, there is a handy guide to pieces for emulating the gentlewoman aesthetic and a shopping guide for everything from books to niche fragrance. It's less a style guide in the sense that you aren't told you need to buy certain items or can't be a true icon if you do not own brogues for example. 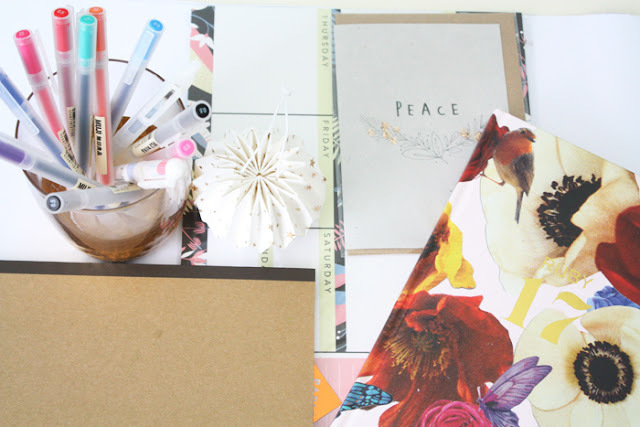 It's more a tome to dip in and out of for inspiration and decide which facets you want to incorporate into your life. The Princess Diarist by Carrie Fisher-This read was unfortunately very timely. I requested it from the library a while ago and it was waiting for me in the days following Carrie's passing. As someone whose never seen a Star Wars film, it may surprise people that I read and loved this. In fact, I'm not going to lie just writing about this book feels fraudulent. What you may not know is I have often been a fan of Carrie's non-galactic work, her other roles, her interviews and her general badassery as a woman who was never afraid to speak her truth. I really loved this book and at times, passages were a bit too real given the recent events however it was still a worthwhile read. In fact, since reading it, I've ordered Wishful Drinking. The Universe of Us by Lang Leav-I'd read Leav's poetry before and loved it but honestly, I found her latest volume a little underwhelming. Don't get me wrong, there were still a handful of passages that resonated with me but for the most part it felt a little unorganised. I also feel like it's wrong to label it as entirely poetry but maybe that is just me. Instead, I'd recommend you read her previous volume, Memories instead. Sweetbitter by Stephanie Danler-Sweetbitter has been on my to-read list for a while now and after waiting an eternity on the library's waitlist I finally read it this month. I'd describe this as The Devil Wears Prada meets Girls. I'm a foodie but I know next to nothing about restaurant culture, particularly on the running side of things and I found that so interesting. As well as that of course there's the drama and scandal involved in a twenty-something's life in NYC. It's as addictive and decadent, as an unputdownable dessert. Get A Life! by Vivienne Westwood-It's a big claim but this might be the best book I have impulse-bought in a while. Get A Life was long, coming in at just under five hundred pages but so inspiring and informative. If you want to learn about climate change, this is just one of the topics Westwood is so well informed on and passionate about. It's not strictly a fashion book per se but you are provided glimpses into the process her and Andreas go through when curating their collections. I also loved her writing on art and its history+significance in the present. Those sections were particularly well done. I gave this 3.5 stars, only because I did not always agree with some of her more sweeping statements on environmentalism and politics but on the whole I thoroughly enjoyed these diary entries. This Modern Romance by Will Darbyshire-This was a birthday present from one of my friends last year and I have to admit, I'd not heard of Will before reading this. I'm a bad YouTube watcher, whatever. This Modern Romance is the kind of book that is lovely to dip in and out of, reading people's beautiful words on relationships in their three main stages. The book is broken up into love letters intended to wax lyrical on the beginning, middle and end of a relationship as well as being interspersed with Darbyshire's own photos. It's just beautiful and some of the letters are utterly heartbreaking. For the most part though this is a book of hope and optimism. Gift it to any of the lovers of words in your life, they are bound to treasure it. -What have you read in January? Leave your recommendations below! Muji-Ahh Muji, when I visited you were packed with a lot of sweaty betties on a 30 degree Melbourne day. It was hot but we were all a determined bunch and the heat was worth it to peruse your shelves of highly covetable, useful items. My friend and fellow stationery enabler Mandy bought me back some of their 0.38 Gel Ink Pens and ballpoint pens recently so I am all set in the writing instrument department. These come in an array of colours and are such a treat to use. Like everything Muji does they are well designed. Their notebooks are fantastic too and are cheap and cheerful, especially if you get stamp-happy in store. Papio Press-I can't take credit for this find, it was after spying them in one of Liv's gift guides that I learnt of their brilliance. Papio Press is the brainchild of husband+wife team Harry and Zanna. They are committed to supporting local businesses so all their products are made in the UK. They're also fans of green business practice so they use recycled paper and even biodegradable plastic. Their work is just beautiful and I will definitely be keeping them in mind for gifts and things this year. Weekly planners are my favourite because they let me see what I have to do each day and what is coming up across the week. I'm not an iCal person so this is perfect for me. I nabbed this floral one for myself but they also have some beautiful designs featuring red pandas, foxes or sloths if they take your fancy. 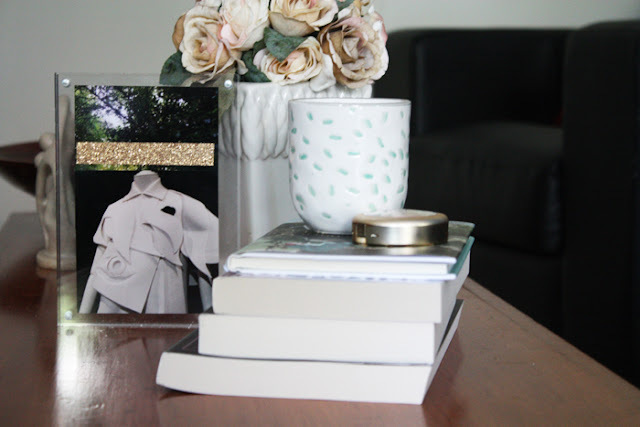 Ruby-While they may be recognised for their beautiful clothes, Ruby also have a select range of homeware and stationery that they also produce. For Christmas I received their 2017 diary from Evelyn and Carolyn over at FashioNZ. It is beautifully designed with floral motifs throughout. 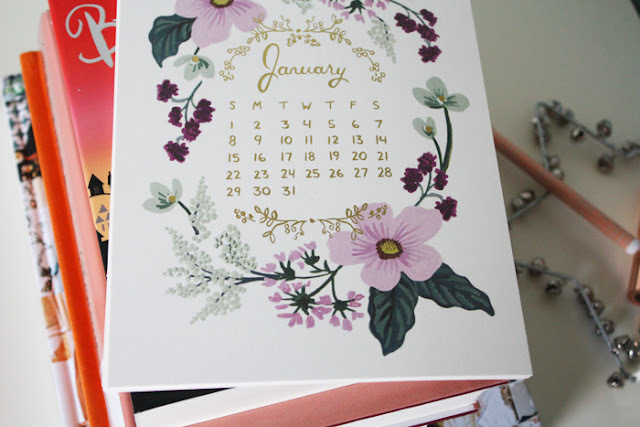 It even has monthly calendars you can scrawl on as well as pages for writing lists, notes and the like. This is my creative diary for 2017 and it's being well-used for planning blogging bits and pieces, as well as freelancing stories among other things. Katie Housley Stationery-Another stationery brand which I believe was a blog find, I just cannot remember whose blog. Katie's designs are just beautiful and are so frame-worthy. Being handmade and just a little different they're the perfect thing to accompany gifts or send to your pals, just because. 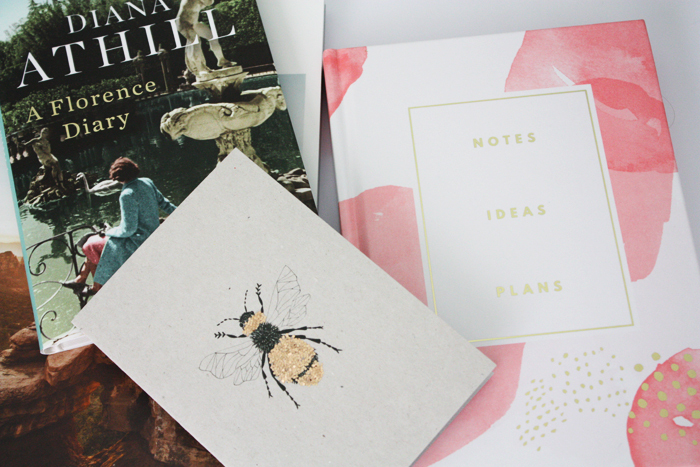 The cards I nabbed were all in the sale, my favourite being this bee card. I also love this birthday card and this hello flower card. Exquisite. Daiso-Ahh Daiso, the haven of $3.50 delights and three for ten dollar treasures. Admittedly I don't really have a ton from Daiso but I love their notebooks. They're such good quality and the fact most of them have plain covers means you can customise them a bit as well if you so wish. They're not quite as good as Muji but they're a bit easier to get ahold of, in Auckland at least so I cannot complain. 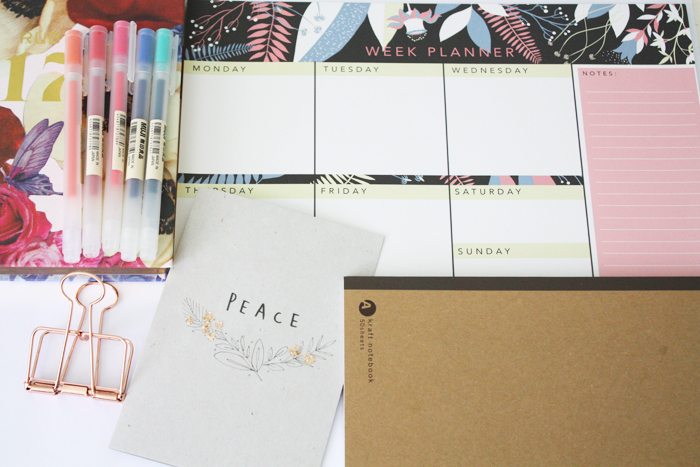 -Do you have any stationery brands you particularly love? Give them a nod in the comments! It may sound like the most gigantic of cliches but to me writing is like breathing. Words and the arrangement of them is always something that has come naturally to me. I'm not sure why, but storytelling, letter writing and just writing in general always have been things I have loved. Perhaps it is the fact that I have control over what I want to say, or in this case type. Perhaps it's the profound, lasting effect that the words and ideas can have. Words are so powerful. There is no denying that. Lately though, I have been experiencing a bit of writer's block or writer's fatigue if you will. I am such a perfectionist when it comes to writing and this year I really want to push myself out of my comfort zone. In particular that involves different styles; poetry, diary writing and life essays are just some of the areas I want to delve into. At the same time though I do have that flicker of self doubt. What if it isn't articulate enough? What if it isn't interesting, engaging or humorous? We are so blessed to have so many gifted writers now and from the past. Lately I've been rereading some of my favourite non-fiction books to try and identify what it is I like about them so much. Not so I can copy their writing. More so I can hope to be inspired by and in turn emulate a bit of their magic. Does any of this ramble make sense? I am thinking aloud here but I think I do need to take the pressure off myself when it comes to writing. Not entirely, otherwise I'll become too relaxed and 'bae' will enter more than just my verbal dictionary*. I just think I need to write and not think about the bigger picture if I am going to be successful here. Maybe I'll publish whatever comes of these sessions. Maybe not. Somewhere where I have been channeling a bit of creative energy though is in my FashioNZ writing. This month I published an article on Summer Beauty must-haves, for more beauty writing scroll through their archives. Seven of the twelve articles on the front beauty news page are mine. #humblebrag. I also wrote on the charming and whimsical Viktor and Rolf exhibit in Melbourne. A place where tulle, beaded dreams became a reality. This piece was one I was rather proud as punch about so I'd love it if you read it. If you have made it this far through this post or stream of consciousness, thank you for reading. If you have any suggestions for tuning out the background noise when it comes to writing or any creative pursuit, please share them down below. *If it ever does, know that I have had some kind of Ben Wyatt of Parks and Rec level meltdown. Descent of Man by Grayson Perry-A recommendation from Jenna Todd, store manager at Time Out and also the latest selection from Florence Welch for her book club, Between Two Books. As someone who reads a lot of feminist slanted literature, I was really intrigued by the concept of reading something about masculinity. Especially when it is complete with a recommendation from Caitlin Moran, "Grayson Perry for King and Queen of England." It looks at what it means to be masculine and a man in this day and age, as well as exploring the idea that maybe our perception and shaping of masculinity and its facets is due a reworking. I can't wait to read and eventually review this one. -Have you read these books? What did you think of them? 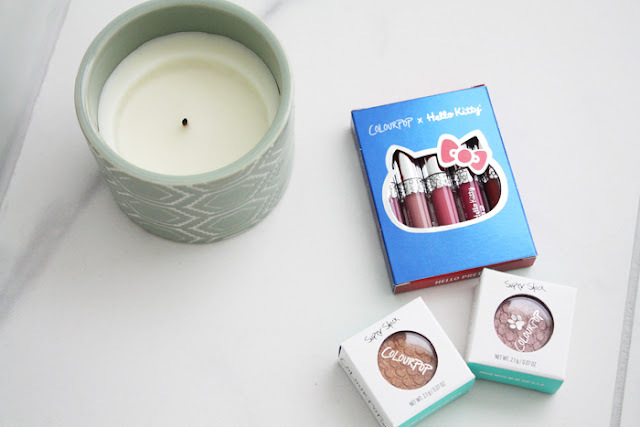 Hello Kitty Puroland Set: The first of the lip colours here are; Tiny Chum, Milk Bottle and Mimmy which are all available separately as full sized shades. I actually wanted the minis because #1 minis are cute and #2 I am more likely to use them up and use them repeatedly. 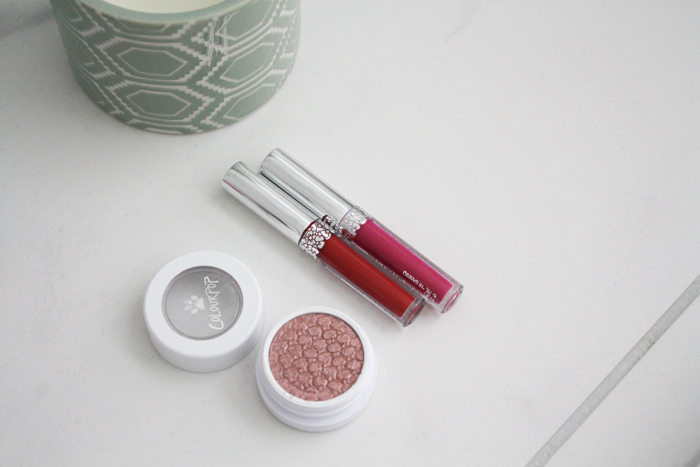 Milk Bottle and Mimmy are in Colourpop's ultra matte formula. Despite their matte quality they are so so comfy on the lips. I'd recommend applying them with a liner first just to keep things neat if you don't have a steady hand. Tiny Chum is in the ultra satin formula, which is a bit more comfortable on the lips. It just fades a bit faster which seems to be standard with lip products that don't dry down completely. All these colours are lovely but my pick of this trio is Milk Bottle, a mid tone pink. Eye Shadow in KathleenLights-Seeing this eyeshadow on Hayley's Instagram made me want it, that and it's been one of the shades I've wanted from Kathleen's range for a while now. This bright golden copper gives me Autumn vibes but it's so vibrant and lovely. It's so beautiful and is one of those shades which I imagine would complement every eye colour. Eyeshadow in Cat Nap-This colour was a bit of an impulse buy as it was for a good cause and while I like it, I don't love it. Don't get me wrong, Cat Nap, an icy rose gold is a beautiful colour. Maybe I just have a dud one but I find because this contains chunkier glitter particles, it doesn't mesh well with my eyelids. Translation: My oily lids vanish it into oblivion. As I said, maybe I have a dud one, maybe it's just too hot in Auckland right now to really properly assess its longevity. It's just not my favourite Colourpop eyeshadow. Lipsticks in Lock Diary and Ribbon-The last of the colours from the Hello Kitty 'Puroland' set are both on the bolder side of things. Lock Diary, a vibrant fuschia is part of Colourpop's ultra satin lineup which may just be my new favourite lip product formula. Ribbon, a matte is an ultra rich, blue based red. Perfect for Taylor Swift fans and lovers of the fifties screen star look alike. I've not worn this colour yet, I feel like it requires a special occasion but no doubt you will hear about it if I end up liking it as much as I think I will. 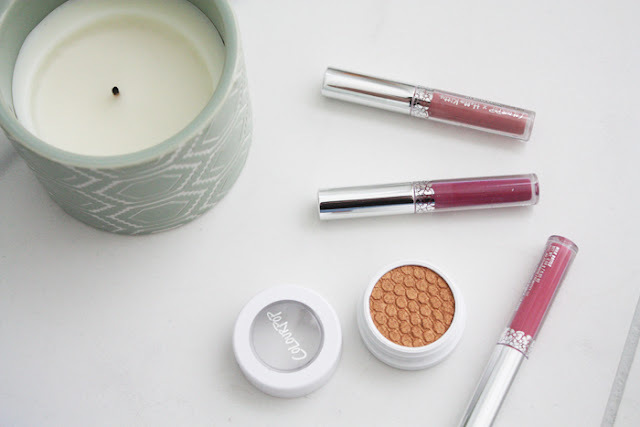 -Have you tried anything from Colourpop before? What are your must-haves from their collection? Last year truth be told I fell out of love a bit with beauty blogging. For many reasons. Rather than take things to a sour level, I want to share with you my favourite beauty products of 2016. This is by no means a comprehensive list but these are all ones that sprang to mind when I was thinking about this post. In fact I am sure I will have left some off unintentionally. These products though are the best of the best and the ones I found myself in many cases repurchasing and using time and time again. The Primer: Hangover Primer x Too Faced is still my all-time favourite face primer. Given how moisturising it feels, you'd think my combination skin would hate it but it surprisingly doesn't. It keeps my base makeup in place for so much longer and adds just the slightest hint of glow. It feels incredibly nourishing too rather than silicone-esque or greasy. Wins all 'round. I repurchased a tube of this at Mecca Maxima in Melbourne but I am so stoked it's stocked on Mecca NZ's site now too. The Lip Duo: Koko K x Kylie Cosmetics and MAC Viva Glam Ariana Grande Lipgloss, limited edition, Kylie's lip kits certainly hit the big time this year and out of the liquid lipsticks I tried in 2016, they remain firm favourites. Koko K, inspired by Khloe Kardashian is my favourite. Paired with this beautiful, iridescent pink lipglass from MAC you have the perfect duo. The gloss adds shine and slightly tones down the matte feel of the liquid lipstick. Admittedly this duo is not windy weather friendly but for the rest of the time, it's a winner. The Palette of Dreams: Tartelette in Bloom's palette was used on high rotation all year. In fact, out of all my powder eyeshadows, these ones are my favourite. Pigmented, vibrant and so versatile. I love the three shimmer shades inside but the mattes are all fantastic too. The Bold Lip: Miranda May x Charlotte Tilbury mightn't be as bold to more daring makeup fans but for me, it's the shade I feel most comfortable wearing on a day to day basis. Yes it is vibrant but it is not as in your face as some of the more electric hues out there and when I want to go a touch more incognito, it's this I reach for. The Neutral Necessity: Doe x MAC Cosmetics is part of MAC's new Liptensity lineup. It is certainly not an essential colour but I find myself using it a lot. It's one of those effortless colours and formulas that you know will last a reasonable amount of time before needing to reapply. The Lash Enhancer: Grandiose Mascara* x Lancome has been my favourite mascara. I think I prefer the original to the newer incarnations but if there is one thing Lancome does well, it's their mascaras. Best paired with a lash curler but it's equally as curling on its own. This mascara doesn't flake or smudge like crazy which is a huge bonus in Summer+in general really. I really want to try some more of Lancome's mascaras this year so if you have any recommendations because I know they have a few, let me know. The Base Essentials: Smashbox Primer Water* and Honey Trap Lip Balm x Lush are godsends. In fact, Lush's lip balms and scrubs are both fantastic. Anyway, Smashbox Primer Water might be luxe but my bottle is still going strong. Compared to other mists this feels a lot finer and less like it's settling on to the surface of your skin. It may be a placebo effect but I feel like it really does make makeup last a lot longer. Honey Trap lip balm is by no means an essential but I always like to prep my lips whenever I am doing makeup. It helps that it smells of vanilla and honey but as far as a lip balm goes it is pretty darn fab. The Complexion Staple: Ambient Lighting Bronzer x Hourglass, in the shade Luminous Bronze Light has been my favourite face powder this year. It's warm but not intensely so, meaning it can be used year-round. It warms my paler skin up without looking orange and adding the slightest hint of glow, without veering into disco-ball territory. It's a bit on the pricey side of things but it's worth the money. For a cheaper alternative, I also liked the Physicians Formula Butter Bronzer for something a bit friendlier on the wallet. It's just a bit on the sheerer side of things for my liking. The Concealer: Age Rewind x Maybelline is my absolute favourite for the under-eye area. My only qualm is that it isn't sold in NZ. It's a godsend for concealing dark circles on the eyes without creasing or looking too thick. I went through a couple of these in 2016 and made sure to repurchase another as backup when I was in Australia. The Extras: Coco Mademoiselle x Chanel, Rejuvenate Intensive Body Balm x Aesop and Beautyblender Last but not least we have these three gems. They don't quite fit into their own categories but are all equally worth mentioning. In short, Mademoiselle was easily my most-used fragrance in 2016. If I wasn't such a fan of various fragrances, it'd be quite possibly the only one I ever use. The intensive body balm from Aesop has been such a saviour for my dry, cracked hands and elbows. It helps that it smells divine, citrusy and vanilla blended in perfect harmony. The Beautyblender might just masquerade as an overpriced sponge, thus fooling us all who are susceptible to it. As far as beauty sponges go though, this really is the best. Light, bouncy and a godsend for quick makeup application. I'd be lost without it, and have been frequently. Given my inability to not lose my sponges at least once or twice a month. -What beauty products did you love in 2016? 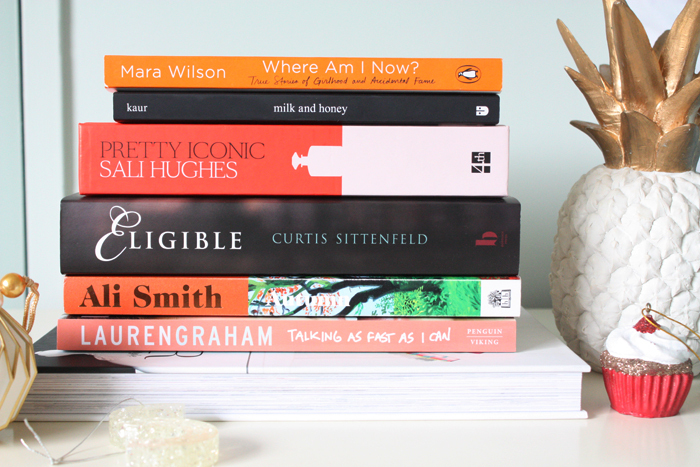 Billy and Me by Giovanna Fletcher-After finishing Swing Time by Zadie Smith at the end of last month, I decided I wanted to start the year with a lighter novel. Both in terms of content and page numbers. I've also just found out that I share a name with the protagonist, definitely not the motive for reading this I promise (!). It sounds like the perfect paperback to read in Summertime, either poolside or by the beach. In the Company of Women by Grace Bonney-One of my two Christmas presents to me, from me. Grace Bonney's book is a collection of bite sized interviews and images of women and their spaces. Women of influence, up and comers and inspiring women are all featured. It is the perfect coffee-table read and from what I've read so far, it looks set to be the ideal book to inspire me, and also encourage anyone who peruses it to aim high this year. Sweetbitter by Stephanie Danler-This novel has been on my to-read list for ages and after waiting what felt like several decades for it to come in at the library, I finally have it. This has been dubbed "a lush, thrilling debut" and it tells the story of 22 year old Tess, a girl who escapes suburbia to fulfill her ambitions in the Big Apple. Her dream being working in a respected restaurant. Sweetbitter is a tale of "discovery, enchantment and the power of what remains after disillusionment". This is another book I will be hopefully taking with me to the beach this month. Get a Life: The Diaries of Vivienne Westwood-Vivienne's newest book was purchased on a whim. Read: I was having a lousy time in the middle of December and felt that I somewhat justifiably deserved a new book. Get A Life is a compilation of Westwood's diary entries, from her online diary of the same name that she started in 2010. The almost five-hundred page tome is as likely to wax lyrical on fashion as it is to consider books that Westwood is deeply moved by and of course political action she is taking. It is also filled to the brim with visuals and imagery that Westwood herself selected to accompany the entries. One for the fashion fans and diary lovers alike. I've only read 100 odd pages of this one so I am looking forward to immersing myself in it and reviewing it properly for you in a few week's time. -What are you reading in January? milk and honey by Rupi Kaur-Raw, real, important. Those three words probably best summarise how I feel about this book. I have passages underlined, pages dog-eared and the book's cover is smudged with fingerprints. It is one of those books I have been recommending and gifting to people because I feel like everyone, women especially need to read this. Where Am I Now? by Mara Wilson-Mara's first book of essays was one of my most anticipated reads of the year and I loved it. It reveals enough about Mara without being a full-on expose of her life so far. She's a fantastic storyteller and I found this book so gripping. I actually reread it again a couple of weeks after first completing it, which is not something I do very often. Biographical writing is something I want to do more of so I am sure this one will get a reread again this year at some point. Pretty Iconic by Sali Hughes-The beauty writing of Sali Hughes is always going to appear magical in my eyes. There is just something so wildly charming about it. Her latest book was crammed with beauty's most legendary products, both in her opinion and that of the wider beauty loving community. They're the products that you're likely to remember from childhood, that Gran has used for ages and the newcomers that have become fixed in our minds thanks to the digital age. Sali's personal anecdotes and insights about each product makes this book all the more brilliant. I love it. Talking As Fast As I Can by Lauren Graham-Another of my book club reads for 2016 was Lauren Graham's and I really enjoyed it. So much so that I want to track the audiobook down at some point. I read this over a day and loved it. The conversational tone made it feel like Lorelai Gilmore was on a long-winded, caffeine fueled speech but in the best way. It's hilarious, engaging and crammed with some fantastic insights about Stars Hollow. If you're a Gilmore Girls fan you need to get ahold of this. The John Lennon Letters by Hunter Davies-I remember seeing this book in the shops when it was first released and being so irritated by its ridiculous price tag. It was forgotten about until watching Nowhere Boy inspired me to look up literature about and written by John Lennon. This hefty tome contains letters, notes, scraps of creative writing and even some of John's to-do lists. All meticulously catalogued and analysed by Davies, who also wrote an authorised biography about The Beatles. If you're a Beatles fan I think you'd find this incredibly interesting. I certainly did and despite its mammoth size, I got through it rather quickly. Autumn* by Ali Smith-I've read a few of Ali Smith's books now and the more I read of her work, the more I find myself loving it. Autumn is a particularly poignant, insightful read that is incredibly timely after the year that was. Shining a magnifying glass on the political fibres of the United Kingdom, relationships and their alterations with the passing of time. This book is comforting. Cosy up under a pile of blankets and have a hot beverage nearby. Christmas Days by Jeanette Winterson-This collection of twelve tales for twelve days was simply brilliant. As well as Winterson's short stories, it also contained twelve recipes and anecdotes about the memories behind them. The stories all shone, my favourite in particular was The Silver Frog but they were all fantastic. I will more than likely purchase this to reread annually in December. Eligible* by Curtis Sittenfeld-This modern-day interpretation of Pride and Prejudice was the one book I recommended the most last year. It may look hefty but it is a quick read. It's witty and just as cleverly done as the original. Reasons to Stay Alive by Matt Haig-For anyone whose found themselves facing difficult times, either currently or in the past, this is such an important book. I'm not going to lie, it is not always the easiest to read. That being said there is something comforting and reassuring about it. If you are going through a rough patch it's well worth having a flick through. The Versions of Us by Laura Barnett-After seeing this novel on Olivia's blog I was intrigued and it ended up surpassing my expectations. This novel again considers the passing of time and the 'what-ifs' of the protagonist's lives, depending on what paths they take. There are three different narratives and they all explore these different alternatives, determined by which individual the protagonists choose to continue their lives with. Each blended together seamlessly and all bought something different to the story. Carol by Patricia Highsmith-The Price of Salt, nowadays more commonly known as Carol was one of the first books I read in 2016 after buying it on a whim in The Women's Bookshop. Side note: I miss working literally doors away from there. It tells the story of Carol and Therese who enter a somewhat scandalous romantic relationship, for the time at which the book took place. As well as looking at their relationships it offers microscopic analysis of the two women as individuals. It is these details that make it the most delectable, visually pleasing novel. Read it and then watch the film because it is equally as brilliant. -What books did you read and love in 2016?